I do not profess to know the psychology of these award selections, and whether they are based on the extraordinary nature of the performances and/or influenced by the compelling story of the women who are depicted in the films. Personally, I have been distracted by the story of a local woman that I believe embodies Ms. Davis’ acceptance speech advice. An ordinary woman accomplishing extraordinary things: King Peggy. 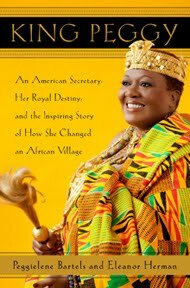 Peggielene Bartels, a naturalized US citizen, had worked at the Ghanaian Embassy in Washington for more than twenty years when she received a phone call one summer night in August 2008, to tell her that she had been chosen to be King of Otuam, a Ghanaian village of 7,000 people on the west coast of Africa. King Peggy, otherwise known as King Nana Amuah-Afenyi VI, accepted the position, and became the first female leader of her tribe. Determined to improve the lives of her people, she started with simple basics such as reading glasses, clean water, education and similar basic necessities we take for granted. King Peggy has co-authored a book with Eleanor Herman telling her story, and she will be sharing her story with those of us in the Washington DC area on February 22 at the National Press Club. While I may not tune in to the Oscars, to be broadcast four days later, I know who the winner will be on February 22nd. And what book I will be reading that week.